A couple of years ago my friend Alex A. took me on a walk through his neighbourhood of Hostafrancs next to the Sants train station with the objective of taking a trip back in time. Alex wanted to show me a traditional taberna like the ones he remembers from his childhood in 1950’s Barcelona. 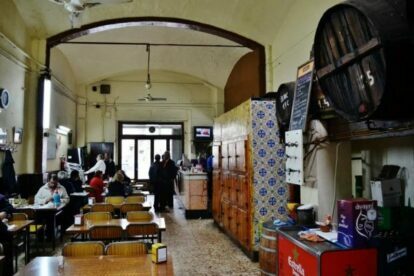 He explained that for an establishment to qualify as genuine in his book it needs to have three principal features – Bodega Carlos has the full trinity of authenticity that Alex demands. Along one wall is a weathered marble bar top, with a vintage ice box with wooden doors and metal handles, and finally a majestic row of large cellar barrels connected to a network of taps from where the waiters pour out the house wines. In other words: perfect. The daily menu is chalked on a blackboard and could not be more traditional. Paella every Thursday, broad beans with pancetta and butifarra, fried boquerones (delicate sardine-like fish) straight from the market stall, and callos, that’s tripe in a delicious sauce (perhaps more suited to the culinary adventurous and delicious to the initiated). Basically, the cuisine of our grandparent’s generation.